"What if my teeth are so cold sensitive they hurt?" There are many reasons why a tooth, or teeth, can become sensitive to cold. The most common reason for severe cold sensitivity is due to deep decay. More commonly referred to as a deep cavity. As the decay gets close to, or reaches the nerve, your nerve starts to get hypersensitive to cold (also to sweet and acidic things as well). It is a built in warning mechanism. If you catch it early, it can be fixed with a filling. How can you tell if it is early? 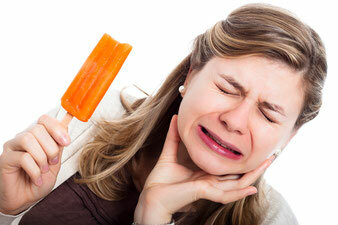 If you can drink some cold water, and then "warm" your tooth back up with your tongue to the point there is no pain. If the pain is gone in 5-10 seconds you can probably get away with only a filling. If it takes any longer than that, you will probably need more than just a filling. If you wait too long the nerve becomes irreversibly irritated. Even if you place a filling the nerve will not calm down on its own. At this point you will need to remove the nerve. There are essentially 2 ways to do this. Remove the tooth (extraction) or remove the nerve from inside the tooth/roots and seal the tooth with a filling (root canal). Another reason for severe cold sensitivity is from a cracked tooth. 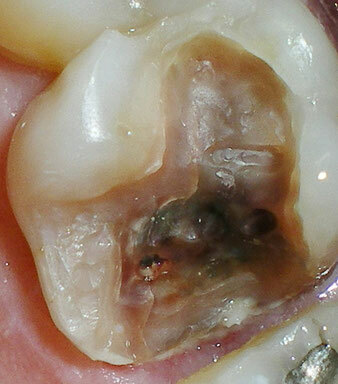 Teeth can have very small, even microscopic cracks in them. These cracks can let cold liquids into the deeper parts of the tooth. Cracks can also be growing toward the nerve. Have you ever bitten down on something hard and felt that "ZING!!"? That is a crack in your tooth. It just grew a little closer to the nerve, when that happens the nerve becomes hypersensitive to stimuli (like cold water or air). A cracked tooth may need a root canal and will need a crown to prevent the tooth from cracking down into the roots. A crack that has made it to the roots is a catastrophic crack. At this point the tooth will need to be extracted and replaced with a dental implant. A filling was placed on this tooth in hopes that it would not need a root canal. No such luck, unfortunately the patient continued to have cold sensitivity. Once the root canal was completed a crown was placed the tooth (and the patient) felt much better.